The Wirehaired Pointing Griffon was originally bred by a Dutch breeder (Eduard K. Korthals) in the 1870's. His goal was to breed the perfect hunting breed. He crossbred the German Griffon with the French Pointer to create the breed. The first WPG was brought to the USA in 1887 where it was recognized by the AKC. The breed is still known as Korthals Griffons in Europe. -This breed is adapted to living in swampy countries because it's coatprovides excellent protection against the environment. 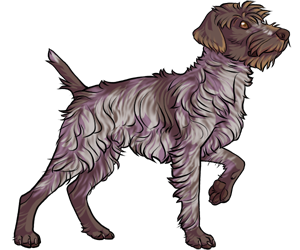 -The Wirehaired Pointing Griffon is an excellent swimmer and retriever.